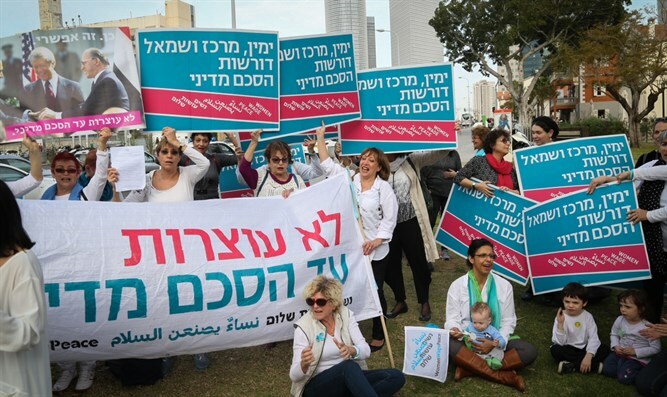 MK Yehuda Glick (Likud) explained spoke to Arutz Sheva about the criticisms hurled at him over his participation in a march by the Women Wage Peace organization in Sderot Sunday. MK Glick said that he has faced criticism from colleagues whose opinions he values, but he remains content with his decision to participate in the march. He believes that those who criticize him do not understand the organization's work. "Anyone who meets with 'Women Make Peace' cannot help but be impressed by the positive and non-inflammatory discourse that they hold at a time when there is no terror wave on the streets. They turn the term 'peace' into something tangible. What happens today, sadly, is that everyone sits only with themselves, and anyone [who doesn't share their political opinions] is monstrous. Unfortunately,we had a lot of hatred during this past year, and I say, let's meet and talk. We talk a lot about peace. We pray for peace, which is wonderful. But we cannot underestimate the need to change the discourse," Glick said. Arutz Sheva asked MK Glick if he was not making life difficult for himself when he talks about changing the political discourse and listens to those who to not share his support for the Jewish communities of Judea and Samaria and for Jewish prayer rights on the Temple Mount. After all, these are issues which could have prevented him from being allowed to participate in the Sunday march. "My positions are deeply embedded in the ideology of the Likud, and these women know that. I tell them at every meeting that I am a man of peace and that includes sovereignty throughout Judea and Samaria, massive construction throughout Judea and Samaria and Jewish prayer on the Temple Mount. If you want to see peace, come with me to the Barkan industrial zone and the shopping centers. Go to Sha'ar Binyamin or Gush Etzion, and you will see that peace exists and Jews and Palestinians live together. I do not cover that up." Glick said that the spokesperson's response was her own personal opinion and did not necessarily reflect the views of the organization as a whole. "They are asking that there be a discussion on the subject of peace, because they feel a sense of indifference and [that people think] that the Palestinians might disappear and the conflict will disappear. They call for dialogue. There is no simple solution. All solutions have problems that need to be discussed. I will participate in the event or they would say that peace belongs to the left. I won't accept that. "It's true that a significant part of their activities are carried out by left-wing women, but I say, let's not leave it to the left. Let's take part. And they know my opinions. I say that peace includes massive sovereignty and construction in Judea and Samaria and they still applaud."